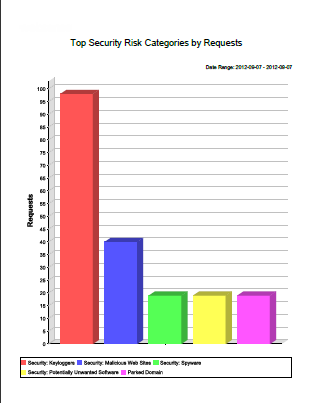 Use presentation reports to create bar charts, trend charts, or tabular reports showing Internet activity in HTML, PDF, or Microsoft Excel (XLS) format. After drilling down into investigative reports data requiring additional analysis. A presentation report is often available that provides additional detailed information over a longer time period, across more users, including more categories, and so on. By those who prefer a report they can print over an online, drill down report. The available presentation report formats may be more readable or usable to some consumers than the available investigative reports formats. Find presentation reports and templates on the Reporting > Presentation Reports page in the Web module of the Forcepoint Security Manager. 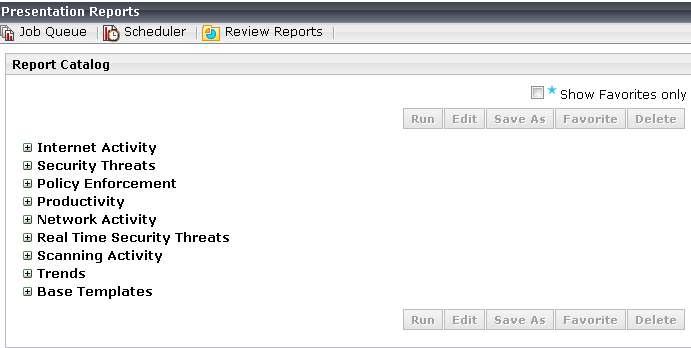 When the page opens, the Report Catalog displays a list of report categories. Expand a category to see the pre-defined and custom reports it contains. Select and run a presentation report. Create a custom version of an existing presentation report or Use templates to create a custom presentation report. Create Favorite presentation reports to make it easy to find and schedule frequently-used reports. Schedule presentation reports to run and Track scheduled presentation reports in the Job Queue. Use Review Reports to view scheduled presentation reports. The page lists generated reports that have not yet been deleted. You can also Configure email delivery for reports Configure how long scheduled reports are stored and Use custom logos in presentation reports. For a list of reports, with a brief description of each, see What information do the pre-defined presentation reports include?.